Here's another film, like The Exorcist, that I have to rate highly because of its historical status more than its value in isolation. In isolation, or, at least seen outside of its particular place in history - say, if it had come out a year or so, instead of 20, after precursors like It! The Terror from Beyond Space, so that It! appeared to be the groundbreaker and template instead, then I would give Alien a lower rating. Which means it's not at all a bad film, but I actually prefer some films that are seen in the conventional wisdom as Alien imitators, such as Event Horizon (although Event Horizon owes just as much to Hellraiser). But as a "serious horror fan," Alien is without a doubt a must see, and various qualities make it almost a must see for fans of any genre. One of those qualities is apparent immediately. Out of the gate, we see a brief title sequence that is unusual for its minimalist design sense. That minimalism continues, at least in spirit, throughout much of the film, and is as responsible for giving Alien its brilliant and unique look as it is unfortunately for making the film move very slow at times. On his DVD commentary track, director Ridley Scott points out a number of times that there was concern that not much happened for the film's first 45 minutes. While I don't agree that "nothing happened" - some of the most important events of the film occur before the 45 minute mark - I do agree that the bulk of the first 45 minutes, and much of the remaining 71 minutes or so, moves too slowly. As for the story, Alien begins with a space mining ship - the Mack truck of the future - on its way back to Earth. The ship's computer, "Mother" (in a ridiculous riff on 2001's "Hal" - Scott said "I couldn't think of anything but to say 'Mum' or 'Mother'"), is supposed to wake the crew out of a kind of "deep sleep" once they're close to Earth, but after the crew of seven awakes, they realize that Mother has woken them up because she's receiving a signal from a planet they just happened to be passing on the way home. When they stop to investigate, as is dictated by their prime directive, they discover an alien ship and half-wittingly bring aboard a nasty visitor, which, needless to say, may not be the wisest thing to do. There are many things that Alien does right. The most notable element is the sets. Alien had a stellar art and production design team, including one of my favorite artists, H.R. Giger, and a great construction crew (also including H.R. Giger in some instances) to realize the design. Scott liked the sets a lot, too, and while they deserve attention - especially Giger's alien landscape (as well as his aliens, but we'll get to that in a minute), Scott focuses on the ship's sets too much, and many shots seem like excuses to do a slow pan across the handiwork. That's one of the things that ruin the pacing. But it's a toss up, in a way. It would be a shame to not see the amazing art, production and set design, and Lee Lighting and cinematographer Derek Vanlint definitely knew how to light and photograph it. It's just that it might work better as a museum piece than a dramatic film in some instances. It's not that Scott doesn't know how to create tension - there are many great, atmospheric, edge-of-your seat scenes, but he's just not consistent enough. 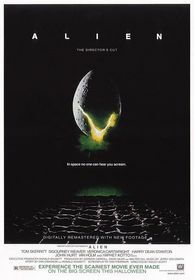 For every two or three tense moments and sequences that will forever be burned into your memory, like the face hugger and the infamous kitchen table chest burster (two reasons alone that almost make this film a must see for horror fans), there are scenes like Brett's confrontation with the alien, which just don't work. During some of the scenes that should be tense, the problem is the incongruity of certain elements. For instance, a minor dramatic scene that should build tension between Ripley and Parker seems silly because of the overdone steam blasting out of the pipes, as if Ripley and Parker were underground in New York City instead. Or, at the beginning of the scene where Brett meets his fate, he's in a room on the ship with dangling chains and what amounts to rain. Why is this stuff on the ship? Why is it raining? You'd think they'd have to be careful with the ship's water supply. Ridley himself has pointed out that some of the elements are more than dubious scientifically and a lot of the dialogue amounts to gobbledygook. I have to agree, and I don't think that it's so excusable. The gobbledygook and the ridiculous elements aren't so bad in a film that's not trying to be realistic, but as Ridley also points out, he was aiming for a realist feel. It doesn't work, and this, in combination with the sometimes-failed tension, is the reason for the subtraction of two additional points. But whenever Giger's amazing work, and especially the fantastic, surreal-but-menacing aliens appear, we forget about all the problems, and Alien settles into what it should have been all along-just a mindless action/monster flick; an excuse to put characters into dark, claustrophobic sets, have them slowly and singly slaughtered by some menace, panicking all the while and plotting against hope that they can dispatch the monster in some way. When we view it in that light, Alien succeeds, even with its many missteps. Submitted by FilmNoirFugitive (not verified) on Mon, 2014-08-04 03:48.